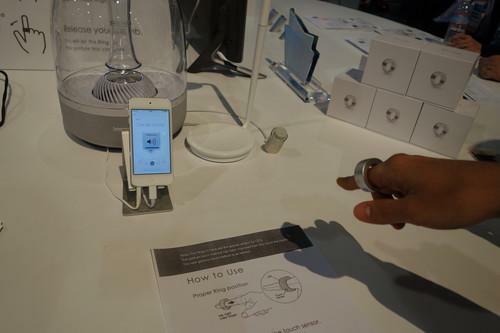 The Ring can let you remotely control your smartphone by making finger gestures. Wearables for the wrist are all the rage at this year's International CES show, but companies are also coming up with devices meant to be worn on your waist, your feet and your index finger. Enter Belty, a smart belt developed by French firm Emiota. When you put it on, the mechanical belt buckle will tighten around you automatically for a comfortable fit. It will then adjust the waist size automatically when it appears you're sitting down or standing up. Emiota designed the smart belt as a way to track the health of the wearer. It does this by measuring changes in the user's waistline, which can be used to predict a person's diabetes risk, said Carine Coulm, the company's co-founder. In addition, Belty can work as a fitness tracker and will even send alerts to the user when they get lazy. "If you stay too long at your desk, it will nudge you and tell you to go out for a walk," Coulm said. Health stats taken from the smart belt can be displayed on the wearer's smartphone. The belt's battery can last about five days, and the belt's parameters can be configured via smartphone. Emiota will begin production of the smart belt at year's end and is looking for partners. The company declined to give a price, but Coulm expects it to be a "high-end" product. Also on display at the CES show was a pair of expensive smart socks developed by U.S.-based Sensoria. The socks can work as a fitness tracker, but they're primarily designed to help athletes improve their running style. Lined under the socks are pressure sensors that can measure how the wearer's foot is striking the ground when running. An anklet that can attach at the top of the sock will send all the data to the user's smartphone. The hope is that the socks can point out flaws in the wearer's running style that might lead to injury, and offer corrective tips. The wearer can also learn the speed, distance, steps taken and other exercise stats from every time the socks are put to use. Although Sensoria has designed the smart socks with runners in mind, they could be used by other athletes, such as golfers who want to improve their swings. Battery life on the socks is about 5 to 6 hours, and the socks can be machine-washed about 60 to 70 times. The smart socks and anklet are priced at US$199 when purchased together, and they launched a month ago, but there is currently a waiting list to buy the products. Not all the wearables shown at CES had fitness in mind. Japanese company Logbar has developed a smart ring that can be used to remotely control a smartphone. Simply called the Ring, the device is meant to be worn on the index finger, and can remotely control functions on the smartphone through finger gestures. The product does this with built-in motion sensors and Bluetooth connectivity. For example, to access the phone's camera, the wearer can gesture the letter "C" with the ring finger. To play music, the wearer can draw a triangle in the air to represent a "play" icon. Logbar has included a whole range of different gesture patterns for the Ring, but they require an app to be installed on the smartphone. The Ring has a range of 5 meters and a claimed battery life of one to three days. The product was funded on Kickstarter, and more units will arrive in March for a price of $269. The company hopes to lower the price to between $100 and $200 in the future.